Since I was a kid I have always been fascinated with the bizarre and unknown. I was always reading books on UFO’s and bigfoot and to this day I still read everything I can get my hands on in the fields of ufology and cryptozoology. Another interest of mine was the travelling sideshow. These were usually small additions to the travelling carnivals and were often tucked off in a corner of the fairground. You never knew what to expect once you entered the tent, usually paying a small sum for access to all of the oddities inside. What would you see? A 6-legged cow? A two-headed chicken? An alien embryo? Regardless of the contents of the tent, it was almost always guaranteed to delight and disgust and yes, I loved it all. Oftentimes these exhibits were advertised with beautifully painted banners that were guaranteed to pique your curiosity. I personally was never into human oddities, living people usually with medical deformities, but if it was an animal deformity or a created gaff, I was there! A gaff is something that is fake, usually put together using natural things, portrayed as real. 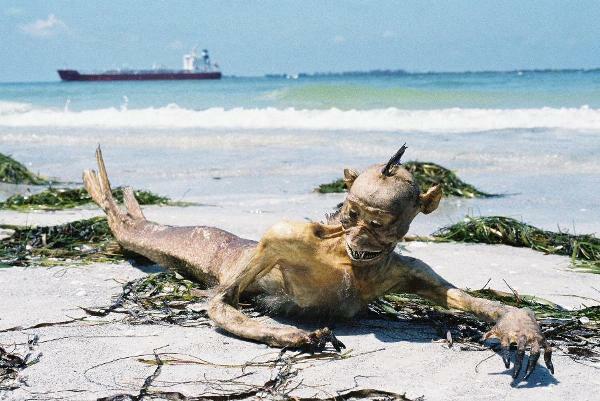 One of the greatest examples of this is the feejee mermaid, which was advertised as real but was actually the torso of a monkey sewn masterfully onto the body of a fish. 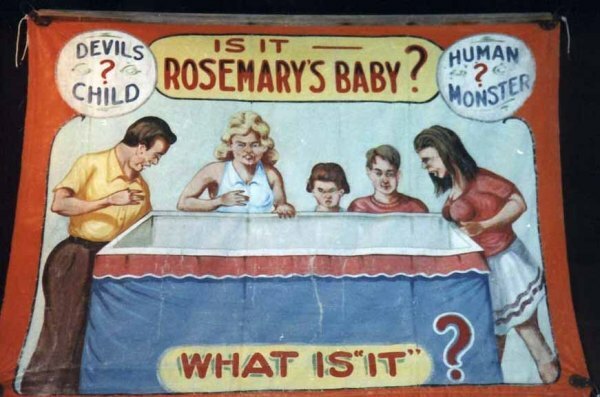 What I want to do with this series is introduce you to some of the greatest gaffes and mysteries that the sideshows had to offer, most of which are from my private collection. Each entry in this series will feature one or more of these bizarre creations and the best part is that you do not have to pay an additional 25 cents to see them in all of their glory! Let’s start your tour with a bizarre little creature that I only recently became aware of. Let me introduce you to…the Jenglot! 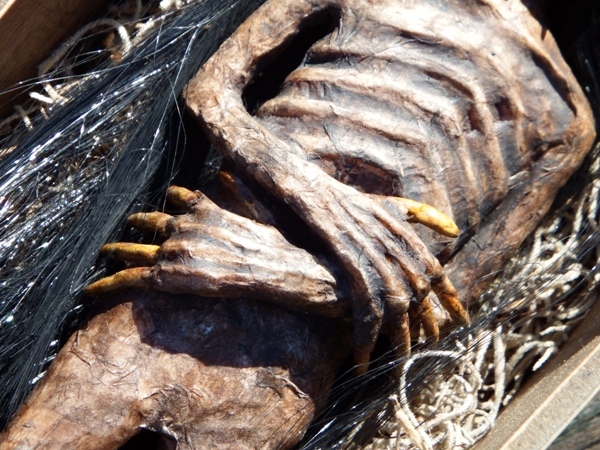 The Jenglot are mysterious little mummified creatures originating from Indonesia. There is not much information on them prior to 1997 and since then have become a bit of a phenomenon. Whether real or man-made is a matter of debate. 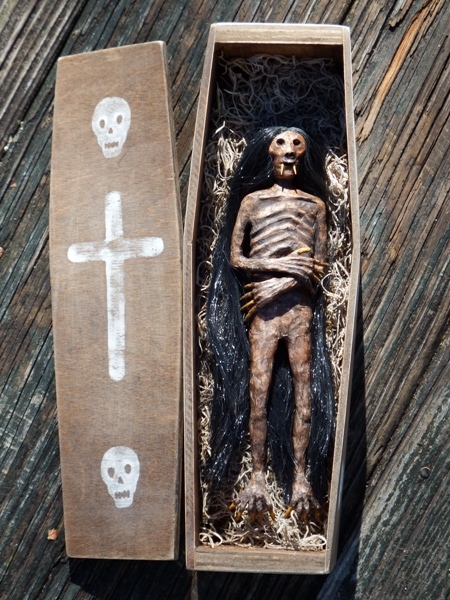 They average about 8 inches in length and are humanoid in shape and feature long, usually black hair, and long fingernails and fangs. 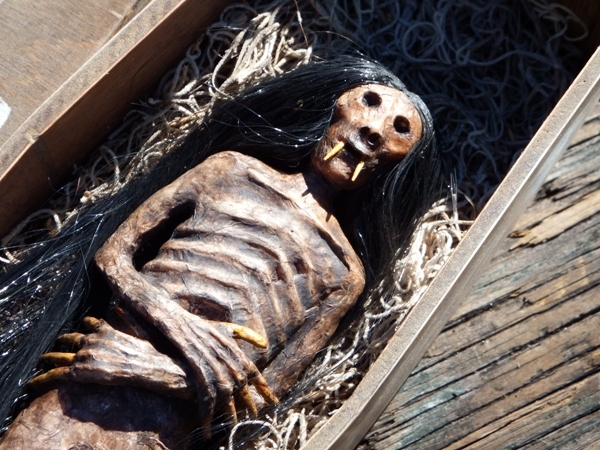 Their bodies are shriveled and strongly resemble small mummies or small vampiric voodoo dolls and will supposedly disappear in a flash if thrown into water. 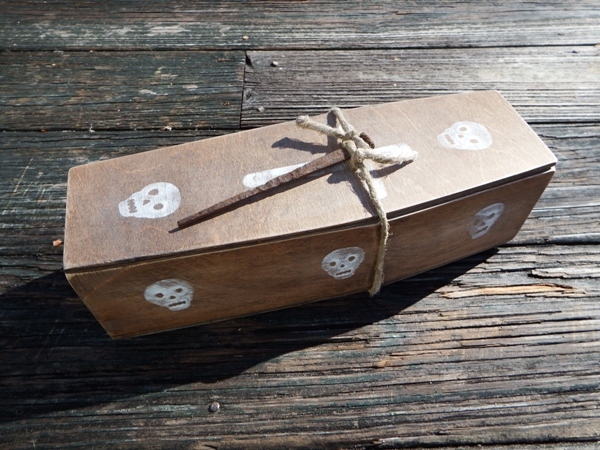 The story behind the Jenglot is that they are the body of someone who died, whose body was rejected by the earth after burial. Because of this the body has shrunk down to its small size. They are rumored to have supernatural powers. It is said though that the Jenglot must be fed blood, animal or human, or bad things will happen to the person in possession of the Jenglot. If the blood-feeding ritual is maintained, the Jenglot is said to provide immunity to its owner from things such as illness and bad fortune. It is believed that only one drop of blood is needed each period and that you do not have to put the blood into the Jenglot’s mouth for it to feed. Most people just put the blood in a small container near the Jenglot and it absorbs the nutrients in its own way. Some believe that the Jenglot actually comes to life when alone to feed. Jenglot are not manufactured but are found, according to legend, by native psychics or shaman after they have performed some sort of supernatural ceremony. They are said to be found in places like in the trunks or trees or even underground. Many of these native psychics travel with their Jenglot, showing it off for anyone willing to pay to see it (sounds kind of like our traveling sideshows of yesteryear). Jenglot have been examined by Dr. Budi Sampurna, in the forensic Cipto Mangunkusumo hospital. His description states that what he examined was 10.65 cm in length and that it resembled a creepy doll that was proportionate in size to a human, except for its long claws and canine teeth. Paramedics, medical students, doctors and forensic experts took part in a study of Jenglot. The results state that the Jenglot is actually a species of primate and that they have similar characteristics of humans. Other tests were inconclusive. They could not say for sure if the Jenglot are alive as they would need lungs, a heart and other organs to live. 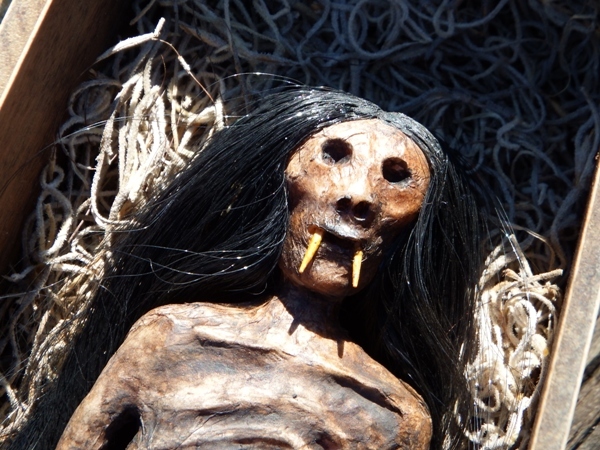 The shaman believe though that it is still alive and that they have strong supernatural powers. More and more of the Jenglot are appearing in Indonesia, especially on the island of Java. It is said that the fingernails, toe nails and hair continue to grow, proving that the Jenglot are indeed alive. So the question is, are Jenglot real? They are real inasmuch as I own one (the included pictures are of my Jenglot). Whether anything else is real is a matter of conjecture and further testing is required to achieve conclusive results. Unfortunately, most Jenglot owners do not want their specimens damaged or destroyed for science, which I totally understand. It does make an interesting keepsake though and is a fascinating story! I hope you enjoyed reading about it as much as I enjoyed sharing it with you! This entry was posted in Cabinet of Curiosities (???) and tagged Attraction, Cabinet of Curiosities (??? 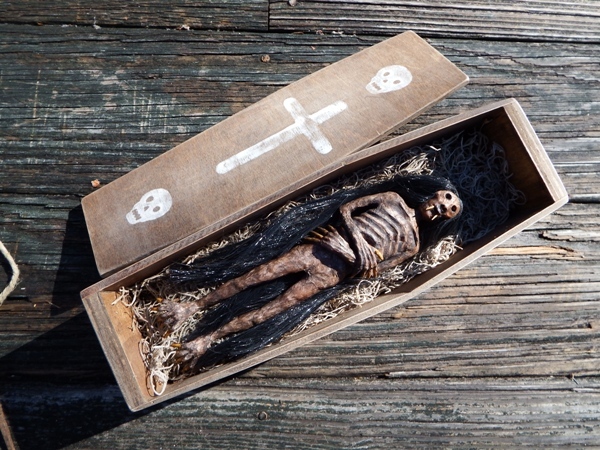 ), Carnival, Cryptozoology, Feejee Mermaid, Fiji Mermaid, FREAKSHOW, Jenglot, Mummies, Oddities, Sideshow, UFOs, Voodoo Dolls. Bookmark the permalink. In my understanding a Jenglot is made by an Indonesian sorcerer from (usually) juvenile monkey skeleton, chicken skin, goat hair, (or sometimes human hair) etc. They are then ritually ensouled pretty much like a voodoo doll, witch poppet or such like. 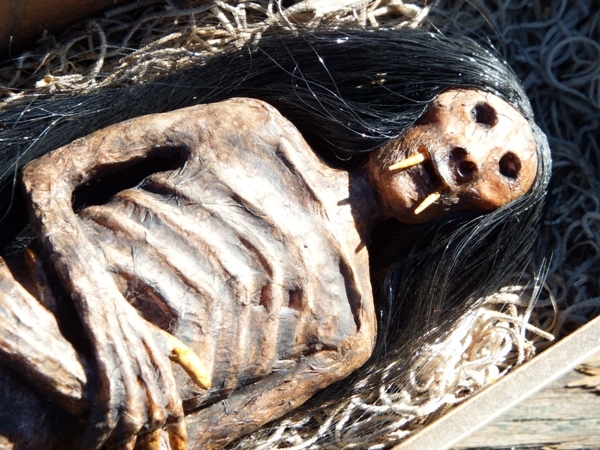 There is no evidence that they are shamans who died and shrank, LOL, nor that they are actual living creatures. They are definitely hand made. Whether they can be possessed by some spirit after ensouling I guess depends on whether such spirits, ensouling etc is real or mere superstition. Thanks for your comments John! I tried to present different possibilities as for the origin of the Jenglot, based on what I was able to find online. I agree totally that they are manmade (but wouldn’t it be fun if they weren’t? LOL). You should travel to indonesia, there are a lot of odd artifacts thereto especially near gunung merapi, the Javanese there says its a doorway to the other dimension, many locals have gone missing there, and a few lucky ones found a kriss, I haven’t been there myself to check it out because I am sundanese and the Javanese spirits do not look on us very friendly..